From a friend’s cellar- Nose of raspberry and Bing cherry. Initial taste consists of a certain effervescence to go with raspberry coulis and some cherry juice. Mild tannins and slight acidity make it easy drinking. The mid palate shows off more cherries and some green vegetal hints. The finish is tart with hints of pomegranate and more effervescence. 89 points from me make this $42 offering a 3 star wine. Pairing wise, it probably could use some Venison or other game. Salut…. My friend pulled this bottle out for us this past Sunday at a gathering. It was delightful. Beautiful clear, delicate red color in the glass with a nose of new world cherry, strawberry and (grass?). On the first taste, very smooth intro to kirsch, cherry torte and cola. Crispy acidity and tight tannins make for a nice mouthfeel. The acidity rolls deep and the length is long. This wine drinks beautifully right now but has the stuffing to go deep into the cellar for 10 plus years. 92 points all day long. 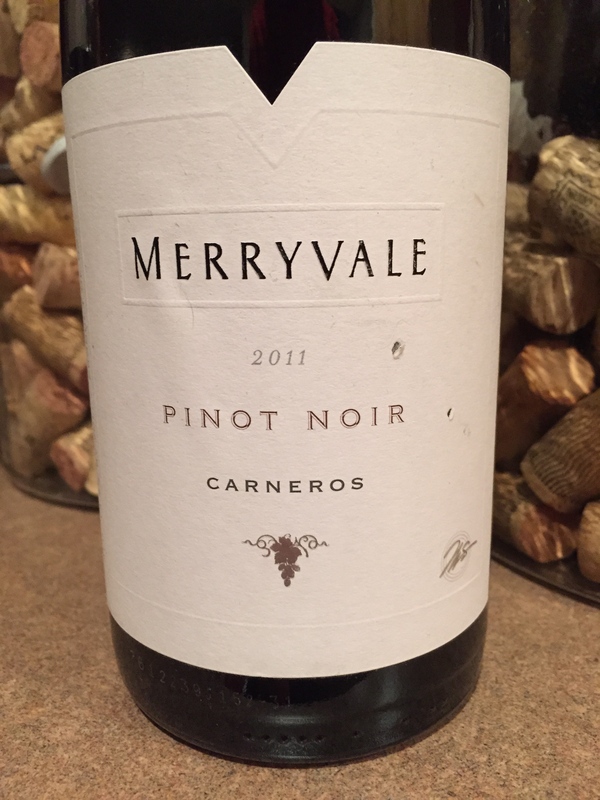 Carneros produces some of my favorite Pinots, and this one sits high on the perch. I believe this is a $40 bottle making it a splurge but 4 stars from me. Salut…. Boom, after last night’s epic Pinot fail I was determined to find something worthy of my time, and the Cornish Game Hens I roasted tonight. This was it. I really enjoyed myself and had to remember how I got this wine. You see, several months ago I opened a Merryvale Merlot that was corked. The folks at the winery got in touch with me after reading about the botched bottle and offered to replace it. Talk about customer service and a class act. So, in finalizing the replacement I was so taken by the representative’s willingness to make sure I was happy I ordered some of their other wines. So far so good I must say. Here we go..
Classic new world nose of bing and white cherries interspersed with some violets. In the glass, a very crimson purple that is see-through- typical of Pinot. On the initial attack there is strawberry, cranberry, cherry and a subtle mouthfeel that is balanced to within an inch of it’s life. Razor sharp focus with a hint of acidity offset by some lurking tannins make this a well made Pinot. I timed a 30 second finish that kept morphing, amazing. I served it up with Cornish Game Hens and steamed veggies that made this wine excel. 92 points from me for this $35 effort make it a solid 4 star wine, but I’m going to give it 5 because I’m in a generous mood. Perfect with poultry and perhaps a cream sauce based dish. Lovely and smooth. Salut….